This tutorial demonstrates how to do character animation in CopperLicht. A character which plays animations when a key is pressed and his clones. In order for this example to work, set the name the animated mesh to 'soldier' using the properties window in CopperCube. In the zip archive of this tutorial, you'll find a .ccb file named animation.ccb which contains exactly this example, you can also use this one. Press space to change the animation, press 'C' to clone the soldier. Use cursor keys and mouse to move the camera. // soldier is an AnimatedMeshSceneNode. Next, we register our own function to intercept key events: If the user presses 'space', we want the soldier in the scene play another animation, and if the user presses the key 'c', we want to create a clone of that soldier at a random position. For this, we first need to find the scene node of the soldier in the scene. We search for it by using it's name in scene.getSceneNodeFromName(). If you named the scene node of the animated mesh differently, you'll have to adjust that name in the code. Next, do something depending on the pressed key. If the user pressed space (key code 32), then play an animation. 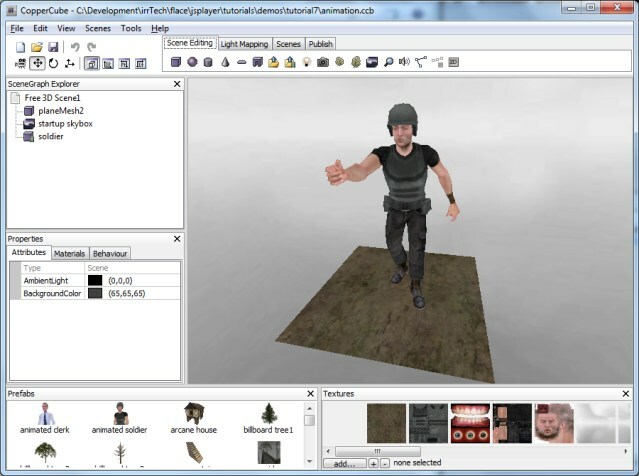 The soldier in this example has the animations 'look', 'walk', 'attack' and 'die'. If your mesh has differently named animations, you should adjust the code in this place. 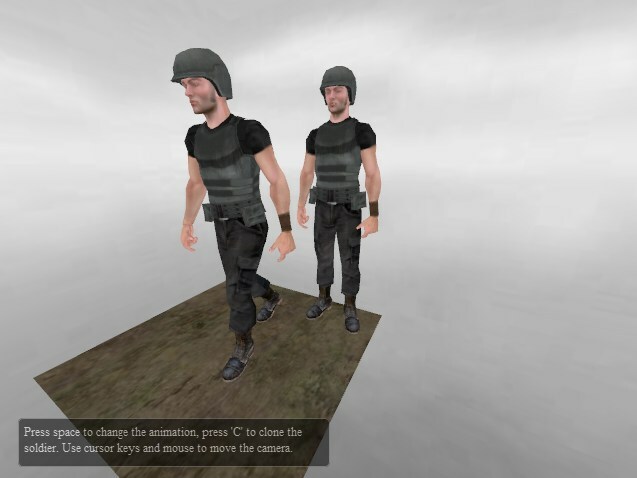 Alternatively, you can also simply enumerate the animations of this model using soldier.getNamedAnimationCount() and soldier.getNamedAnimationInfo(). But anyway how you are dogin it, it's basically just calling the function soldier.setAnimation() then, to switch to another animation. When the user presses the key 'C' (keycode 67 or 99), we create a copy of the soldier and place it at a random position. And basically, that's it. Now you know how to use skeletal animated characters in CopperLicht.